ALBUM ROCK 540 - WXYG "THE GOAT"
WELCOME TO ALBUM ROCK WXYG. If you grew up listening to underground, progressive rock, free form radio, or if you're just discovering or re-discovering the golden age of rock for the first time, we think you will be really happy that you have finally found your radio home. We are returning to a better time when radio played all the great music - GENRES BE DAMNED! 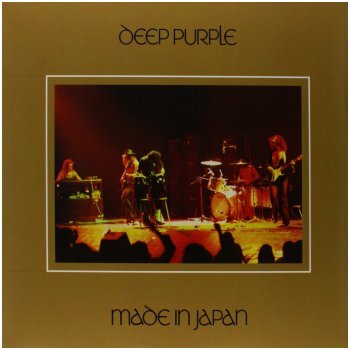 Thousands and thousands of the greatest album rock songs ever recorded. This is not a classic rock station where they play the same 200 songs over and over again. This is album rock WXYG. You will be able to listen to us over the air or you can tune in to our high quality internet stream. Please feel free to suggest your favorite songs to us. We will do our best to play them for you. We welcome your suggestions and feedback. Please let us know how we're doing. 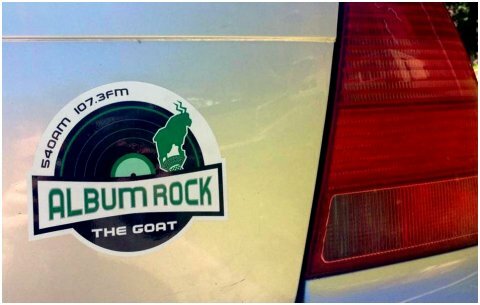 The folks here at album rock "The Goat" who by the way are local owners and operators, hope that you love our new broadcast adventure as much as we love bringing it to you. Now presenting a new age in broadcast radio - radio that returns the power of great music TO THE PEOPLE. Please enjoy....Ladies and Gentlemen - ALBUM ROCK WXYG. 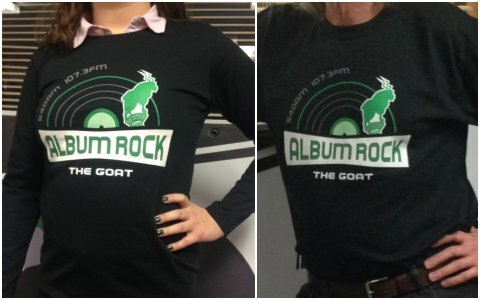 THE NEW GOAT T-SHIRTS ARE IN. Select sizes are stil available!!! 1) Anywhere that Al Neff or The GOAT are appearing, there will be stickers. 2) Come by the WXYG studios in the “Red House” Mon-Fri during Business Hours. 3) Send us a Stamped, Self Addressed envelope. The stickers are 5” X 6” in size, so please send a “size appropriate” envelope, because you wouldn’t want us to fold your sticker. * FIREFOX USERS: be sure to disable your AdBlocker before trying to load the add on. Got an android phone: Our regular streaming provider does support android phones...however...There's a great app that we found for Android phones at www.tunein.com that carries our live stream. By the way is also supports iPhone, iPad, Palm, Blackberry, Samsung, Yahoo TV, Google TV and Roku. In the world of Progressive Rock, 1969 established progressive rock albums and bands as the number one most important music being produced. From The Beatles to the Stones to Led Zeppelin to Crosby, Stills and Nash to CCR to the Allman Brothers Band, everything being released seemed like magic music. "The Long Play with Al Neff" is a continuing Sunday evening Feature on The GOAT. This year, Every Sunday Evening, Album Rock WXYG, The GOAT will feature a full album at 8:00 PM from the halcyon musical days of 1969. Tune In and Turn On, next Sunday Evening, April 21st, and every Sunday evening at 8:00 PM for The GOAT'S "The Long Play with Al Neff". Into the Music is a series of radio profiles which highlights the artists, events, eras and evolution that shaped the sounds of popular music. Into the Music provides listeners with a concise entry-point and guide to rock, pop, blues & folk music. Into the Music is created by Hwy. 61 Productions to provide an informative, entertaining resource for each listener's own mission of musical discovery. Our goal is to spread the sound and story of music through radio syndication, to as many people as possible... and help get them more deeply into the music. Al Neff is a 30+-year radio veteran who has been refining the Into the Music concept for the past decade. He has a Master's degree in Popular Culture Studies and a black belt in Rock Trivia. This station does not discriminate in the sale of commercial time, and will not accept advertising which, in its sole opinion, is purchased with an intent to discriminate unlawfully on the basis of race, gender, or ethnicity. The advertiser hereby certifies that its purchase of commercial time is not made for an unlawful discriminatory purpose, including specifically that it is not based upon a decision to place advertising on a station on the basis of race, gender, or ethnicity.